Still Seeking Sanity: Not Me! Monday! Birch Bay Edition! Welcome to Not Me! Monday! This was created by MckMama, go over to her blog to see what she and everyone else have NOT been doing this week! This weekend was our annual Girl's Weekend in Birch Bay. This is the fourth (or fifth?) year we have done this, and it is a blast. This is the same group of girlfriends that are responsible for toilets in people's yards and breaking into people's houses while they are on vacation. I love these girls, it is fabulous that we are all so very different but we all get along so well. I would trust any of these women with my life, but not with the keys to my house. Love you all! We get two condo suites and spend the night. We are VERY quiet and responsible, we do NOT eat too much, stay up too late, and drink. This was NOT the first year that no one in the group was pregnant or nursing, and we were NOT soooooooo looking forward to the night. My personal favorite drink is Jack and Coke Pepsi. It has been a while since my friend Jack Daniels and I had hung out together, but Girls Weekend sounded like a perfect opportunity. I did NOT purchase a bottle of Jack Daniels, and consume the entire bottle myself. This Girl's Weekend fell on Holly's birthday, so she did NOT insist that we not do anything to celebrate her birthday since it should be just about the girls. We did NOT completely ignore her request. We did NOT plan a gift exchange and pre-plan which number she would pull out of the hat, so that she would get a specific gift. It was NOT the greatest moment of the night when she unwrapped her gift. 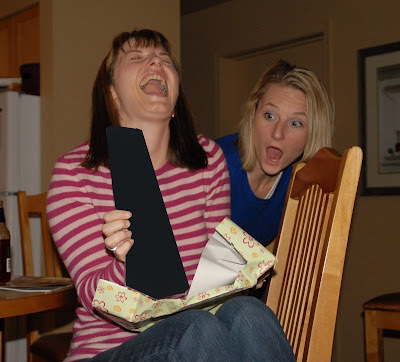 We do NOT have the rule of what happens at girl's night, stays at girl's night, so I did NOT need to blur out the actual gift to protect the innocent guilty. I was NOT thrilled at the idea of a mini-family vacation and jumped at the chance. We had just put the kids down for a nap when she called, so we threw some stuff in a suitcase and as soon as they woke up, hit the door running. I am DEFINITELY so organized that it is no problem to pack that quickly, I did NOT feel rushed and really felt like I was forgetting something. Have I mentioned that we live six minutes from Birch Bay? Yeah, not really a big deal, right? We got there and were finishing up dinner when The Smell came. Any parent of children knows The Smell, the one that tells you to suddenly be busy so that the other parent has to change the baby. Uh, I mean, the one that tells you that you should really attend to your child. Like now. We I did NOT discover at that time that we I forgot the diaper bag. I sent Marty home for the bag, and attempted to stall on Drew's diaper. I started to see some liquid leaking out on his pants, and knew I needed to act fast. I was NOT thrilled to remember that I had thrown some swim diapers in the suitcase, and grabbed one as well as some wet paper towels. During the process of oh-so-carefully changing him so that the poop did not spill everywhere, Drew did NOT manage to get a hold of the diaper and pull it up, smearing his face with poop. Nope, Not my child! That would be gross. Ew. And wet paper towels are EXCELLENT at cleaning up nasty poop. They do NOT just smear everything everywhere instead of actually cleaning. I did NOT end up with poop on Drew's face and hands, and all over my hands, his clothes, and the carpet in the condo. NOPE! Other that that, we did NOT have a great time with Dan and Holly! Last night after we got home and unpacked, we had family game night. We did NOT find this a perfect opportunity to bribe the children with finishing dinner and cleaning up the toys to see who got to pick the games. My children did NOT have their dinner done and they room picked up faster than I have ever seen them move before. And I would NEVER allow them to sit on the dining room table to play the game. That would be COMPLETELY unsafe and irresponsible. I do NOT have a little wild boy who likes to ham it up to the camera super-fast. We did NOT have the best weekend that we have had in a long time. Thank you, Dan and Holly, for the opportunity to stay, and thank you, Mom and Wayne for canceling so that we could go! WooHoo!! That sounds like an absolute blast!!!! Your girls' night sounds like so much fun! The dirty diaper had me cringing. My youngest had one so bad ths mornng that I skipped the wipes and went directly to the tub. So jealous of your girls weekend. Great Not Me's this week!!! How blessed you are, not only to have a group of women around you whom you can depend upon, but to all have the opportunity year in and year out for a ladies only getaway! I think you've inspired me to suggest this with my own girlfriends! You are welcome. I just love that picture of Tiffany and I! We will have to plan on you all coming to the condo next year! That sounds like an amazing Girls Night out. I'm jealous! hahahahahahahahahaha......my computer has been at the doc's so I'm just now reading this & seeing THE picture!! Love it :) It's gonna be hard to top that! I was looking for blogs about Birch Bay to share on our site and I came across your post...If you're open to it, shoot me an email at jane(at)dwellable(dot)com.